Father Gregory Boyle, affectionately known as “Father G,” is justly celebrated as a successful social entrepreneur for his vision for, and leadership of, Homeboy Industries in Los Angeles. 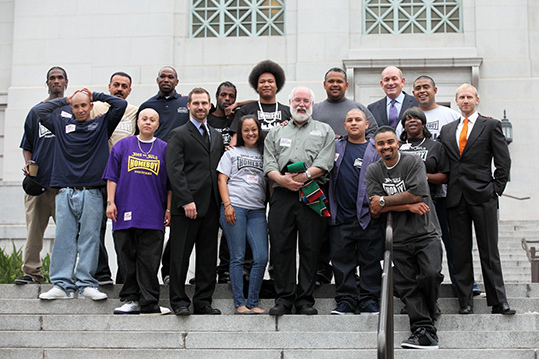 Its several operating businesses embody the motto of Homeboy Industries: “Nothing stops a bullet like a job.” And beyond Los Angeles, its Global Homeboy Network encourages innovative strategies among other organizations for gang intervention in diverse cities around the country and the world. Thousands of lives have been touched and transformed by the program. New frameworks for diagnosing and addressing the challenges and opportunities in dealing with kids and gangs have been developed. Father G has drawn the attention of George W. Bush’s White House (and particularly Laura Bush), and both he and Homeboy Industries have been featured in documentaries, books and newspaper profiles. He even has a TEDx video. Fr. 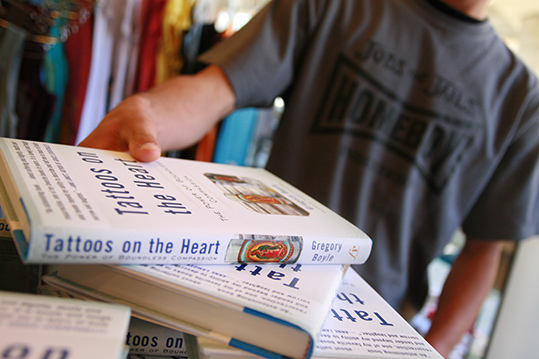 Greg Boyle's memoir, "Tattoos on the Heart: The Power of Boundless Compassion," was named as one of the Best Books of 2010 by Publishers Weekly. Photo courtesy of Homeboy Industries. I had known that Father G is a Jesuit priest, and that being a Christian is central to his identity and work. Early in his moving memoir, “Tattoos on the Heart,” he writes, “Not much in my life makes any sense outside of God.” His stories, and his life, shine forth with the light of Christ. Until recently, though, I hadn’t quite realized how deeply his Christian faith animates his vision of Homeboy Industries. I, like many others, had seen Homeboy as a remarkable example of social innovation whose visionary founder just happened to be a visionary priest. After spending significant time recently engaging Father G in conversation, I realized that Father G isn’t a Christian who also is a social entrepreneur; he is a Christian social entrepreneur. What do I mean by this distinction? Father G moves beyond a framing of Christian faith and social innovation to display how Christian faith animates social innovation in a distinctive way. Father G keeps the vision plain and bold. He notes that while it will surely come, we also need the patience to be willing to “wait for it.” There is a profound patience in Father G’s vision and work, even as it is accompanied by a sense of urgency to bear witness. The genius of Father G is that he speaks these words in the same breath with words like jobs, prison reform, therapy, gang rehabilitation and drug testing. His commitment to social innovation is an expression of his Christian life. If we are in fact kinfolk, then we ought to be in relationship with our brothers and sisters and foster their flourishing as they do so for us -- even if, perhaps especially if, they seem so different from us. Father G’s vision for Homeboy focuses on healing and wholeness, for people, communities and systems. Rooted in his vision of God’s reign, Father G’s work holds together what others push apart. He cares as much about the kids’ souls as he does their bodies, jobs and relationships. Homeboy Industries began as an experiment, a jobs program, to support gang kids in finding new life, and to help change the environments in which they live. Its first commercial ventures, Homeboy Bakery and Homeboy Silkscreen, have become the cornerstone of the organization, which now includes nine businesses in several locations (including Los Angeles City Hall). Fr. Greg Boyle, Homeboy workers and city officials gather on the steps of city hall to celebrate the opening of Homeboy Diner. Photo courtesy of Homeboy Industries. Father G has recently observed that he doesn’t think Homeboy’s well-known motto, “Nothing stops a bullet like a job,” gets at the heart of their mission. “It’s about healing,” he says. Jobs are a key part of that healing, but only part. Early on, he says, the focus was too much on transactions for jobs and job training, and not enough on relationships and healing -- healing of the souls of the gang members, healing of the community, healing of our relationships one with another. It is, he suggests, about our unlearning the profound brokenness that diminishes and divides us from one another and learning to delight in our common kinship -- and even hold one another in awe. Today, Homeboy’s services include not only jobs programs but also mental health care, legal aid, substance abuse support and tattoo removal. Its campus also functions as a community center. Father G is at his best as a visionary priest, and he entrusts the institutional expertise to others. Father G recognizes that Christian social innovation is a team sport. He embodies a humility shaped by his ever-deepening intimacy with God, a humility that enables him to focus on how best to accomplish the mission rather than presume he needs to be in charge. Early on, Father G had to play most of the roles of a social entrepreneur; over time, though, he began to realize where his gifts lie and where he needs to depend on and empower others. Father G recognizes that there are gifts he brings to Homeboy Industries as a priest: vision, storytelling, blessing, helping the pilot light of hope catch fire. Even his “recruitment” strategy to attract gang kids to Homeboy is deeply rooted in his celebration of Masses in diverse settings, especially in jails and prisons. He also candidly admits that he is neither particularly good at the day-to-day administrative tasks of leading an institution nor particularly interested in them. If you want to know about how to build and lead a remarkable institution, he directs you to others. Father G, whose leadership at Homeboy extends more than two and a half decades, says he isn’t particularly worried about succession planning, because other people are in place to lead the organization. Businessman-philanthropist (and board member) Bruce Karatz has helped Homeboy discover new revenue-producing strategies to make the nonprofit more sustainable financially. A former gang member, Fabian, now leads the drug counseling aspect of Homeboy’s work. Father G has cultivated virtuous cycles of training and leadership for the whole organization and beyond. Those efforts address the sustainability of the day-to-day institutional operations. When the time comes for Father G to step away from the work, though, they will not easily replace his priestly leadership, which has cultivated a culture where, as he says, quoting Julian of Norwich, “we are ‘clothed in God’s goodness.’” It is tempting to focus only on the gang intervention strategies and underestimate the significance of Father G’s Christian vision in shaping Homeboy’s culture. Father G’s hope gives Homeboy Industries its lifeblood. He continually points to miracles, kinship, awe, blessing and delight, even as he acknowledges the pain, brokenness and suffering. Father G is no optimist; he has buried too many kids felled by gang violence. But neither is he a pessimist; he has witnessed too much transformation. He embraces both a hope-filled future orientation and a clear-eyed awareness of humanity’s brokenness. He shines that hope through his vision of God, his work for healing and wholeness, and his empowerment of others to lead. Father G’s witness and leadership invite us to see how the end is our beginning, to learn to see as God sees and to join the team of Christian social innovation.